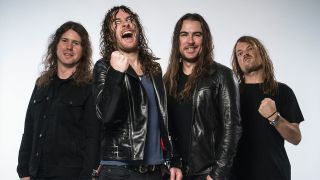 Since forming in Warrnambool, Australia, in 2003, Airbourne have dedicated their lives to flying the flag for rock ‘n’ roll. And after losing our fearless leader, the dearly departed Lemmy Kilmister, at the end of last year, you could argue they’re the next in line to carry the torch for rampant, riff-driven entertainment. Their upcoming fourth album Breakin’ Outta Hell is out September 23, via Spinefarm. But what is it all about? Breakin’ Outta Hell is out September 23, via Spinefarm.